Yesterday we saw Ezra’s shock and prayer. 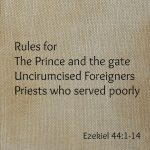 Today in Ezra 10:1-17 we see a people changed. 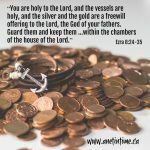 While Ezra prayed and made confession, weeping and casting himself down before the house of God, a very great assembly of men, women, and children, gathered to him out of Israel, for the people wept bitterly. 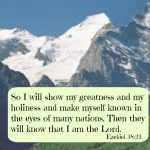 2 And Shecaniah the son of Jehiel, of the sons of Elam, addressed Ezra: “We have broken faith with our God and have married foreign women from the peoples of the land, but even now there is hope for Israel in spite of this. 3 Therefore let us make a covenant with our God to put away all these wives and their children, according to the counsel of my lord and of those who tremble at the commandment of our God, and let it be done according to the Law. 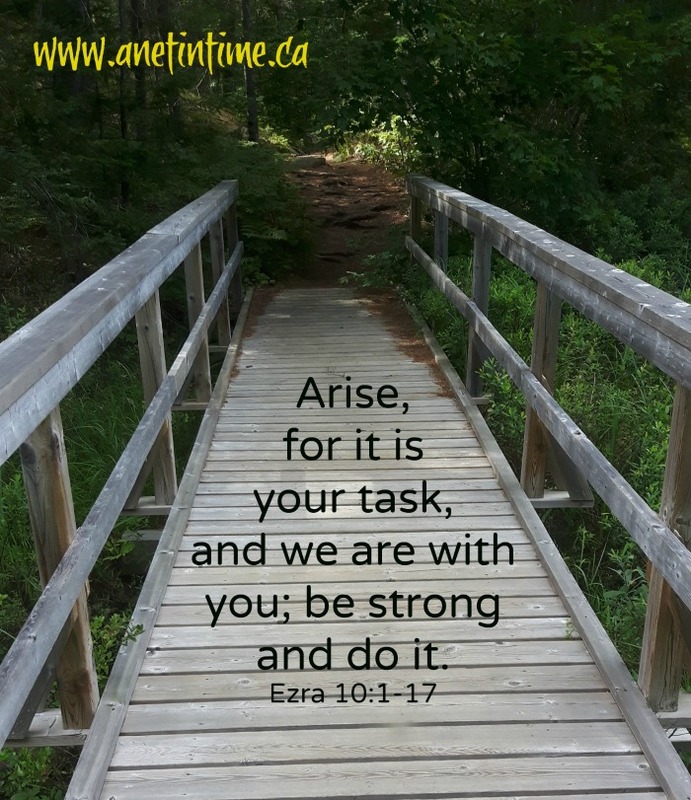 4 Arise, for it is your task, and we are with you; be strong and do it.” 5 Then Ezra arose and made the leading priests and Levites and all Israel take an oath that they would do as had been said. So they took the oath. 16 Then the returned exiles did so. Ezra the priest selected men, heads of fathers’ houses, according to their fathers’ houses, each of them designated by name. On the first day of the tenth month they sat down to examine the matter; 17 and by the first day of the first month they had come to the end of all the men who had married foreign women. 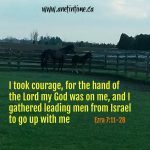 We come into this passage seeing the people of Israel gathered around Ezra as he made a confessional prayer. Their reaction: the people wept bitterly. AND they saw their sin “We have broken faith with our God and have married foreign women from the peoples of the land“. They make a decision: Therefore let us make a covenant with our God to put away all these wives and their children. I have to tell you this. When I got to their decision my heart broke for those women and children. Knowing that they would face a life of hardship now. Removed from their husbands, thrust out of a land they had been taken into. Sent into their people groups again. Oh.. that would be hard. Part of my sorrow comes from knowing the history of Canadians. My son and I were learning about the Metis today (the children of French men/native women) and how they weren’t accepted by either people. My son noted “it’s not the fault of the children what their parents did. Why do we need to create such divisions?”. And while I understand the need for God’s people to be separate from the world, at the same time the pain of the Metis (and their eventual anger) is fresh in my mind. Would it be hard for the people to do this? I think so as verse 4 tells us this : Arise, for it is your task, and we are with you; be strong and do it. Oh I love that verse. We are with you (deliberately not having to do it alone). Be strong and do it (deliberate encouragement). Ezra took some time away, fasting. He mourned over the faithlessness of the people. While he did so, all the exiles were called together. A penalty set in place should anyone be tempted not to answer the call to gather in three days times (lost of land and banishment). Verse 9 brings us to the people gathered together before the house of the Lord God. It’s cold and rainy day, the people trembled from cold and because of the matter facing them. A decision was reached. The women and children of foreign wives would be ejected from being among the people. The exiles were great in number so they decided to do this in an orderly manner. It took from the 1st day of the tenth month to the 1st day of the first month to remove all the women and children. Now I have to admit, I sit here wondering. Where do I find Christ in this passage? Christ is in the bible from start to finish, it’s just a matter of finding that truth. I need to let my mind ponder this a bit so let’s roll with my thoughts eh? God hates sin. He hates our faithlessness. Israel sinned and saw by the witness of Ezra how horrible that sin was. Seeing someone so shamed by your actions they sit stunned and not eating for a whole day…that had to make an impact. And it did. The people responded, they acknowledged their guilt, they made a decision to turn away from that sin of theirs’. Now.. see it. They turned from their sin. They did it in an organized fashion but it was a deliberate action. Do you see the deliberation that happened? They saw their sin. They made a decision to turn from that sin. They saw their sin because of the witness of Ezra (the shock, sadness, fasting and praying). They even made a plan to stop sinning in this way. Do we take that kind of deliberate action to expel sin from our lives? 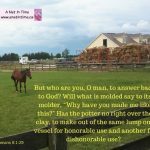 Do we see our sin? And if we do, what do we do with it? I think of my own life. I used to bend the truth a lot to make myself look better. When my lad was young I made a decision that I would never deliberately lie to him. God had made it clear to me that he can’t lie. He just can’t. And so, I acknowledged my sin in this area and, even in my weakness, I made a decision (a deliberate one) that I wouldn’t lie to my boy on purpose for whatever reason. I look at my life and I don’t always see this deliberation. I have made some deliberate decisions about sins in my life, sins that affect others, but the less “in your face” ones I have a harder time with. I think there are other areas of my life that I need to make a deliberate choice about. I need the motivation just like the Israelites did. The question is… where DO I get that motivation? Who can I see as a witness that calls me to account? I think that’s part of the problem… I don’t see it as clearly. Oh that could. It would make it so much easier! This.. this is what I need to pray over. And I can say this.. I need prayer. I need prayer that I can make deliberate decisions about the sins I need to face up to in my life. Will you pray with me?